One of the first rules you learn about removing stains is that the quicker you do it the easier it is. To help you always be prepared when stains happen you should create a stain removal kit that you keep in your laundry room, or whatever area of your home you deal with washing clothes. Below I've listed the items you should keep in this kit, and why. 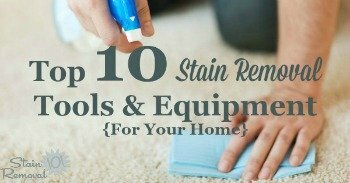 Since we mostly frequently deal with laundry stains in our homes this list is focused on those types of spots and spills mainly, but you'll find that many of these same products I've listed below for your kit will also help you with spills and messes throughout your house, such as on upholstery and carpet. Therefore, you may find yourself running to the laundry room to get the necessary stuff to clean up when an accident happens elsewhere in the house. I know I do in my own house! What Do I Mean By Create A Kit? 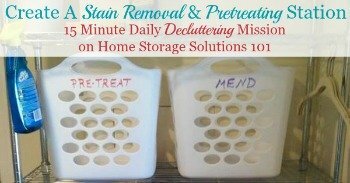 I've gotten asked many times what I mean by creating a kit, especially from those of you visiting from the sister site, Home Storage Solutions 101's Declutter 365 missions, since making a stain removal station is one of the daily missions while we work on organizing the laundry room. What I'm suggesting you do is not difficult, but instead it is to gather up all the necessary supplies you'll need for removing the most common types of stains into one place, and make sure you've got the necessary supplies on hand now. That way when the inevitable stain happens you can grab what you need and deal with it without lots of hassle. To make the kit you can put the items in a basket to contain them, or you can also just place them, grouped together, onto a shelf or cabinet in your laundry room. Whatever works for you. I would suggest, however, that you place this kit somewhere close to the rest of your laundry supplies, since many of these items (as you'll see below) are often used not for just washing clothes, but for stain removal purposes as well, so it just makes sense to keep it all together. Further, ideally you'll keep everything near the washer so you can do some presoaking or pretreating of various items, and then throw them into the machine. Finally, make sure to keep your free laundry stain removal chart that you get, when you sign up for the Stain Removal 101 newsletter close as well, since it will help you remember which of these items you should use for the various types of stains you frequently encounter. Here's the products I think you should have in your stain removal kit. I've broken it down into commercially available products, and then products you can use to make your own stain removers. Both have their uses in your kit. Laundry detergent - very useful not only for washing clothes, but also for using as a pretreater and also as a presoaker added to water, especially enzyme based laundry detergents. Laundry pretreater - for many light stains a simple spray with a good laundry spray stain remover, or stain stick, will be sufficient. The link goes to lots of reviews of these commercially available products to find the best ones. Bleaches - including both chlorine bleach and oxygen bleach. Dry cleaning solvent - I don't use these solvents often, but they can work stain removal miracles. Click the link for more information about what it is, how to use it, and what brands I recommend. Baking soda - great for absorbing greasy spills on clothes, and a general laundry booster. Borax - works wonders as a general laundry booster, helps remove odors, plus removes dirt and mud stains well. Dish soap - awesome for removing greasy stains plus combine it with hydrogen peroxide for my favorite homemade stain remover recipe. Ammonia - removes acidic stains, such as many fresh stains such as from perspiration. White vinegar - removes rust and hard water stains, and can also be used as a homemade fabric softener. Rubbing alcohol - solvent, used for removing ink and more. Hydrogen peroxide - as mentioned above, this is one of the ingredients in my favorite homemade stain remover, plus it works well on protein based stains like blood and also on some tough tannin based stains like grape juice and wine. Acetone - for tough stains like nail polish. What Equipment & Tools Do You Need? Above I mentioned all the stain removal supplies you should put into your stain removal kit, but you will also need some equipment and tools to remove stains. 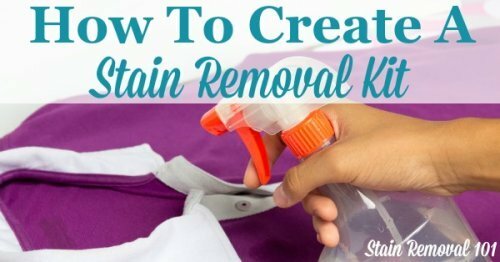 I've created a full list of helpful equipment for stain removal here, but none of it is hard to find or complicated to use. I would definitely keep an old toothbrush in with your supplies that you can use to gently rub stain removers into spots and spills, plus a large bucket or basin that you can fill with water and a presoaker, to soak heavily stained clothes before washing them. Finally, if you like to make your own stain removers keeping some bowls for mixing, and some bottles for squirting or spraying the products onto the spills and spots is also a necessity. Here's an example of a stain removal kit, made by a reader, Ginger. She obviously didn't put every one of the items I suggested into her kit, but that's completely fine. You pick and choose what you want in there! All my suggestions are just that, suggestions, not commands. Ginger said, "my house is very small so I didn't have room for a whole station. I made a stain removal kit instead, for our house and one for our guesthouse laundry shelf too. This will help everybody!" By the way, in case you're wondering, the attachment to Ginger's laundry detergent container, which keeps it from dripping and making a mess, can be found as shown below. They're great! 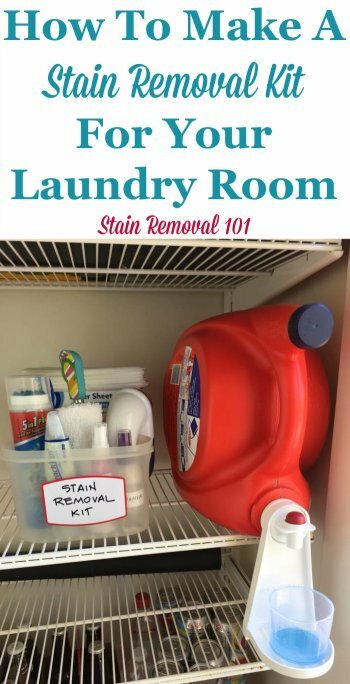 You can also see ideas for how to organize and store your stain removal products in your laundry room in the stain removal station Declutter 365 mission I mentioned above. Here's the article!